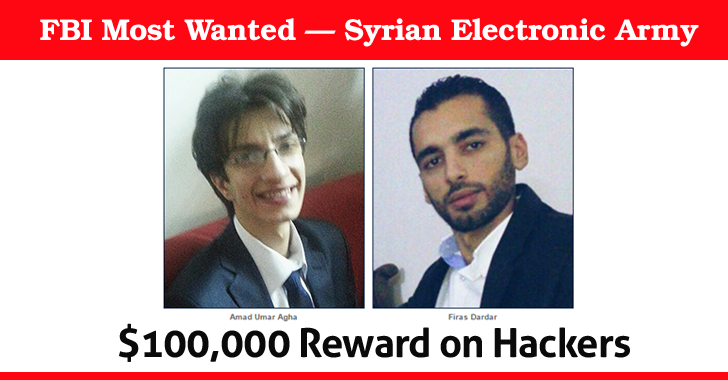 Syrian Electronic Army (SEA) Hackers have made their place on the FBI's Most Wanted List. Agha and Dardar were allegedly involved in hacking Associated Press Twitter account in April 2013 and spreading a false rumor claiming that the White House had been bombed, injuring President Obama. This caused a temporary stock market dip. The two hackers allegedly engaged in a long-running cyber-propaganda campaign in support of the Syrian President Bashar al‑Assad. They hacked into various Twitter accounts of the main news organizations from 2011 to 2013. Their victims included Reuters, the Associated Press, E! Online, Time, CNN, The Washington Post, The Daily Dot, Vice, Human Rights Watch, Harvard University, NASA (which assisted on the investigation), US Marine, Microsoft and even The Onion. "The conspiracy was dedicated to spear-phishing and compromising the computer systems of the US government, as well as international organizations, media organizations and other private-sector entities that the SEA deemed as having been antagonistic toward the Syrian Government," the US Department of Justice (DoJ) statement reads. Once successful, spear-phishing efforts by the duo allowed them to allegedly use stolen usernames and passwords to deface various websites, redirect their domains to the sites controlled by the conspiracy, steal email as well as hijack social media accounts. All three alleged SEA members were using Gmail and Facebook accounts to coordinate and pass around stolen data. The Feds managed to track their activities after obtaining court orders to search their online accounts, which helped them identify the hackers. "The tireless efforts of US prosecutors and our investigative partners have allowed us to identify individuals who have been responsible for inflicting damage on US government and private entities through computer intrusions," US Attorney Dana Boente said in a statement. "Today's announcement demonstrates that we will continue to pursue these individuals no matter where they are in the world." Arrest warrants have already been issued for all three hackers. Agha and Dardar have been added to the FBI's Most Wanted list. The bureau is offering a reward of US$100,000 for any information that leads to their arrest. All of the three alleged members are thought to be resident in Syria. The United States government is inviting tip-offs.